Since I’ve already done two posts on ribs, I thought I’d just post up the links to the recipes I used for my latest experiment: spicy oven-baked pork ribs. Note: I would normally try to get this dry rub onto the ribs the night before, although I marinated the ribs this time for about 2 hours before I started cooking – tasted great! Also, those a bit wary of spice but who still want that “kick” should maybe halve the amount of chili and cayenne, or omit one of those from the mix. I set the ribs on top of a water bath (oven tray + tin toil + water + oven rack + ribs) and then wrapped the entire tray in tin foil. That goes very carefully into the oven at 200 (celcius) for about 2 hours. 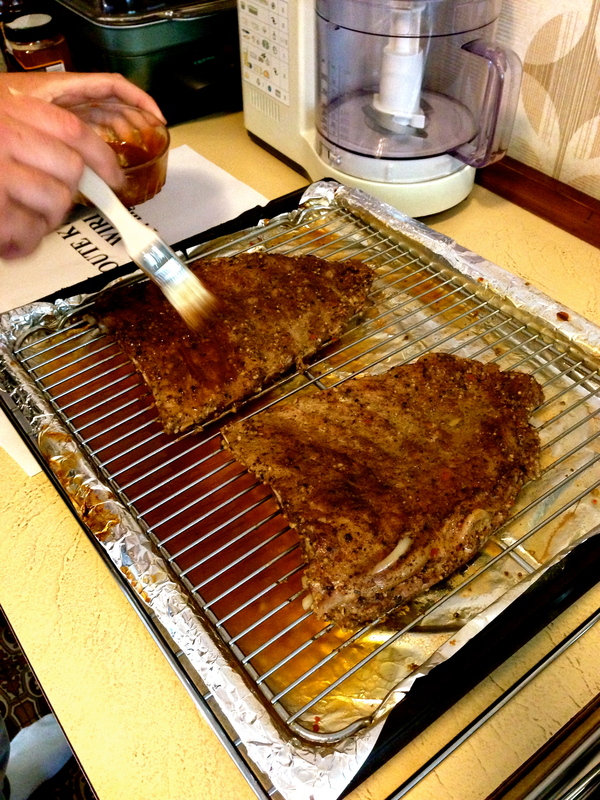 After that, take off the tin foil on the outside and baste the ribs in the sauce. I basted each side twice over an hour. For some reason I get such intense cravings for ribs so this will definitely not be my last post on ribs! Ribs are a strange passion of mine – they’re messy, far from feminine and every time I order a rack of ribs people stare at me with what I’d like to think is a mixture of surprise and admiration. I’ve had many amazing rib meals but I’ve also had a fair share of mediocre ribs, one of which was at a certain local pub (quantity over quality) and another was my own forgettable first attempt. My boyfriend got some really sound rib-cooking advice from a workmate who use to be a chef and I had been tormented by severe rib cravings for about a month before we finally cooked them last weekend. We used pork spareribs, with a dry rub of pretty much everything I had in my spices drawer: dry mustard, paprika, chilli, nutmeg, allspice, salt and cracked pepper. I’m not sure why I put allspice or nutmeg in it but it turned out just fine. 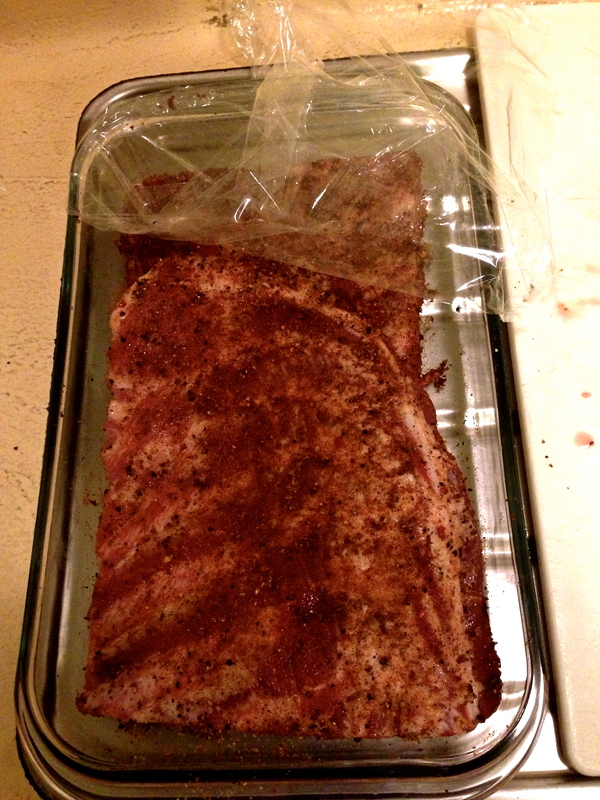 I dry rubbed the ribs, cling filmed and refrigerated them until it was time for cooking. The oven was preheated to about 225˚C (not fan-forced), which we found out later was probably a bit too high. We lay down foil on an oven tray, filled the tray with water, placed a metal rack on the tray and then the ribs on top of the rack. We then covered it all with foil and placed it into the oven for 2 hours. By that time the meat came off the bone really nicely so we started basting the ribs in a honey BBQ sauce – each side twice before we finished the cooking process. I have to admit that we technically cheated with the sauce because it came from a bottle but I guess that’s something to improve on for next time! These were genuinely some of the nicest ribs I’ve had in a while and what made the experience even nicer was being able to go through the process with my partner. There’s definitely something incredibly attractive about a man who can cook! By the way, there’s only 4 of us and yes, there are heaps of left-overs but there is no doubt that all of it will be eaten before I leave for Perth this Saturday. 1. Preheat oven to 180˚C/160˚C fan-forced. 2. 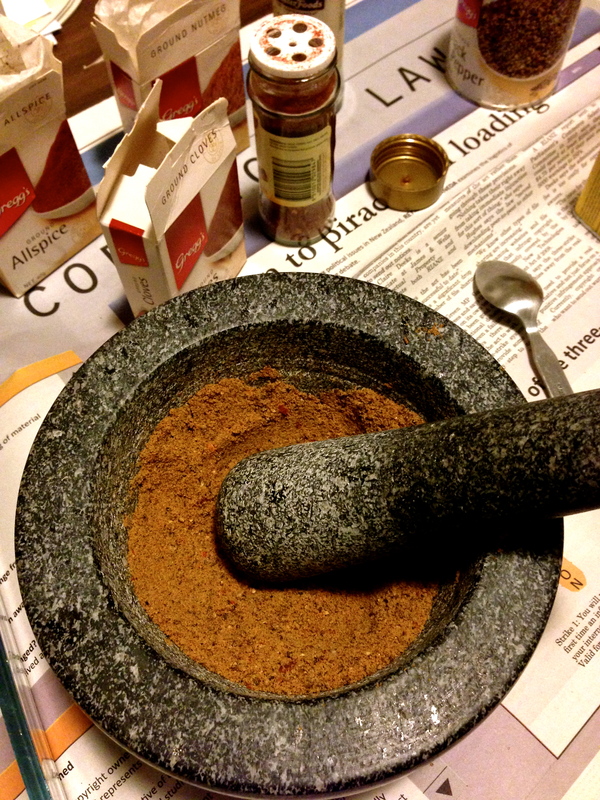 Mix together the honey, sugar, cinnamon, water and mustard powder in a saucepan and bring to the boil. Stir until all the sugar has dissolved. Take off the heat. 3. Remove the rind with your fingers, being careful not to take off the layer of fat underneath (I need more practice with this one!). Score the fat diagonally, making sure that you don’t cut past the fat and into the meat. 5. Brush the glaze over the rump (leaving some more additional glazing later) and place in the oven. I also pushed some whole cloves into the fat before placing in the oven. 6. Keep glazing throughout the whole time it cooks. Cooking time for me was about 90 minutes but I may have had the temperature a bit low. The meat turned out great though; very moist and the sweetness of the glaze went very well with the saltiness of the pork. Lunch was served around midday today and I think my stomach has only just shrunk back to something that resembles its normal size. It’s terrible, this gluttony, and even more terrible is the fact that I let this day be an excuse to pig out. But when you don’t celebrate Christmas for the religious reasons, what better things are there to celebrate on this day aside from the precious time spent with your loved ones and the fantastic food that you all get to share? A “Before” picture of my pork ribs before I sealed them up and put them into the fridge to take in all the flavours overnight. Crushed garlic, grated ginger, hoisin sauce, olive oil, soy sauce, honey, tomato sauce and a bit of tabasco make up the marinade. The original recipe that I have based this off can be found here. I’m sticking to Asian-inspired flavours, surprise surprise, but I absolutely love these flavours. I have to admit that I didn’t really measure anything – I just put in very rough estimates of the measurements from the recipe and spent about half an hour adding and tasting to get the balance of saltiness, sweetness and spiciness right. Fingers crossed that it turns out good!